Most people have probably heard by now that world crude oil prices are in a dramatic plunge. In the futures market, the price is down 47% since June, from $107.68 per barrel to $57.49. The scuttlebut is that prices in the cash market are even lower as desperate countries and companies get what prices they can. And it isn’t just crude oil prices that are crashing. Think stuff that China used for its “economic miracle,” like the price of iron ore (used in making steel), which has been cut in half since 2013. 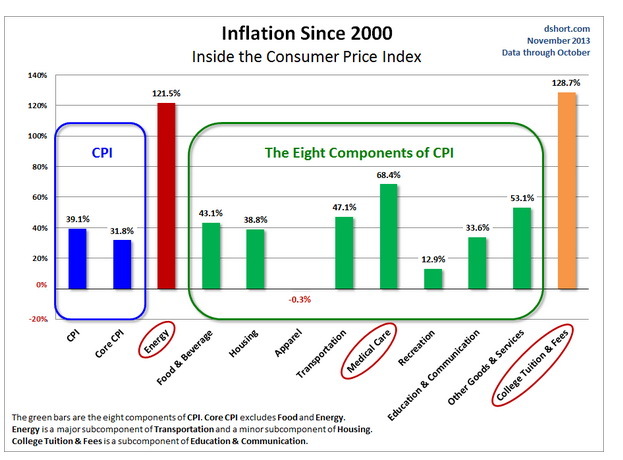 So, why the intensifying deflation? Because, as has been explained here on several occasions, the world is groaning under an increasingly fierce debt load. The central banks have printed up $11 trillion in new money in the last 5 years to try to fend off deflation. Why? Because when debt loads get too large, some people and companies can’t pay back their loans, so they default, and the money they owe disappears. If they are companies, their employees lose their jobs. So their households spend less. Putting pressure on more businesses because of lost sales. Leading to more layoffs and more defaults. It’s a vicious cycle, an economy in reverse, and economy that is deflating. Remember, because all of the money in the system is debt, the economy must always grow to pay the interest on that debt. If the economy stops growing, the interest can’t be paid, defaults arise, and the deflationary cycle ensues. People tend to associate deflation with falling prices, but the falling prices are the result of deflation, not its cause. So the central banks tried to ease the debt load by lowering interest rates to zero or lower. But one of the results was that all that cheap money financed all kinds of projects that would never have been created without this almost-free money because they weren’t very good ideas to begin with, such as the stories we’ve all heard about China having 3,000 companies all basically in the same business–how can they all make money? They can’t. Such overcapacity makes life tough for all of the companies, which all have to lower their prices, which start laying off employees, which can’t pay back their debts, etc. etc. as explained above. So this lowering of rates might seem to work for a short time, but when it’s carried on for years, it’s deflationary! The second thing the central banks did was create this new $11 trillion to buy more debt! So they are trying to fight a problem of too much debt by creating more debt! Historians will marvel at the lack of logic by an entire academic profession. The reason for this pervasive illogic is that academic economists have for years purged from their ranks anyone who brought up the topic of gold as real money, ridiculing and marginalizing them. So they banished logic from their own ranks. Any hope that global demand would provide a floor for oil’s freefall was dashed as the leading energy forecaster cut its outlook for the fourth time in five months and crude extended its tumble. Frankly, I don’t think I’ve ever heard of one of these international organizations like the International Energy Agency cutting their forecast four times in five months. So what’s happening is collapsing demand for oil. Several recent financial statistics that measure changes in the economy are reporting levels of decline “last seen in 2009.” Recall that in 2009, a lot of people thought the world economy was not just staring into the abyss, but was about to fall in. Now how does this relate to yet another “miracle” discovered by the pom-pom and short-skirt-bedecked economic and political cheerleaders, the “US shale miracle”? This is the miracle by which the US will allegedly frack its way to energy independence. All told since early 2010, these energy producers have borrowed at least $550 billion. Remember that the size of the sub-prime mortgage problem was around $1.1 trillion, and the collapse of that sub-prime mortgage market nearly took down the whole system. These oil frackers have borrowed over a half trillion just since 2010 and now it looks like a lot of that borrowing will not get repaid, that is, they will default. Now that $550 billion was a lot of spending for purchasing equipment and creating jobs to use that gear. It turns out that 1/3 of business capital spending in the US in recent years has been for energy exploration and production. And some estimate that 90% of new jobs created in the US in the last five years are related to energy production. But now suddenly, no one wants to lend the frackers cheap money to create more overcapacity in the shale patch (because the lenders know there is a good chance they will never get paid back.) So now there will be a huge drop in equipment purchases and lots of job layoffs, leading to, you guessed it, more deflation! So, the “US shale miracle” will be proven to be another fable, along with the US energy independence it was supposed to engender. It was fueled by a supply of ultra-cheap money that has now dried up. One aspect of fracked wells is that they lose 70% of their production capacity in two years, and 80% to 90% in three years. So to keep more oil flowing, these fracking companies have had to borrow more and more money to drill more and more wells. As described above, it wasn’t a very good business model and would not have existed were it not for the cheap money being provided to Wall St by the central banks. So while you may be able to buy cheaper gas for your car, the US economy is likley to take a serious hit relating to jobs and business spending from the oil collapse. But not to worry: Uber, the emerging ride sharing service, is said to be valued at $40 billion. (Those must be some rides!) And Jessica Alba’s new diaper-cleaning service company is apparently valued at $1 billion! So I guess everyone will get rich (again, like in the year 2000) from internet startups? Historically, deflation is rather unkind to stock prices. World stock markets are currently being floated by the free money from the central banks, but how long can that last? And this deflationary trend has supports beyond the overload of debt, such as the end of several cycles, including the the 26,000 year precession of the equinoxes, which tends to really clear the decks on this planet. and likely hanging onto their hats to get ready for a very wild ride. Because sometimes, in reaction to deflation, governments really ramp up the money printing presses, and people lose all confidence in government money, which is known as hyper-inflation. The Department of Treasury is spending $200,000 on survival kits for all of its employees who oversee the federal banking system, according to a new solicitation. As FreeBeacon reports, survival kits will be delivered to every major bank in the United States and includes a solar blanket, food bar, water-purification tablets, and dust mask (among other things). The question, obviously, is just what do they know that the rest of us don’t? The first column, CPI, says plenty: That if you live in the US, since the year 2000, the purchasing power of your money, of your salary, has lost 39%. And this is during a period that they claim has had “low inflation”! And the US Federal Reserve is currently on record as saying they are trying to create more inflation. So when you own US Dollars, or items denominated in Dollars such as US stocks and bonds, or items in currencies pegged to the US Dollar, realize that this is only going to get worse. The same is true for the purchasing power of the other currencies. The post What’s up with the metals? Part 1 showed that some notable gold bears had turned bullish and that unprecedented demand for physical gold continued. Despite the strong demand, gold then had the bargain price of $1,237 per ounce, having just bounced up from $1,181 on the last day of 2013. Price went to $1,355 Monday and has pulled back to $1,338 today. 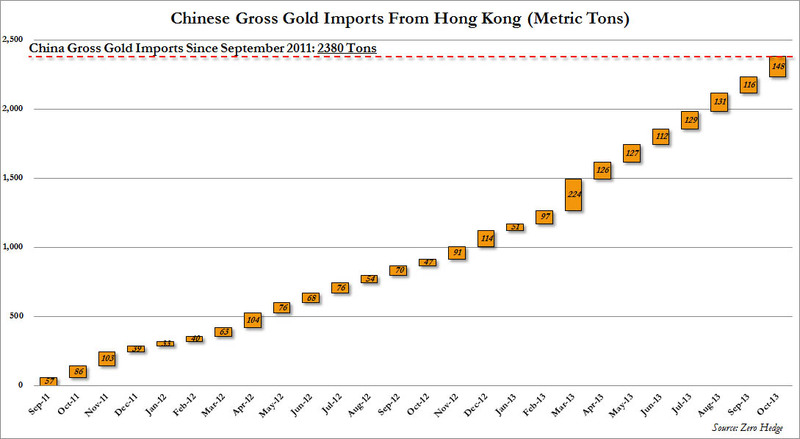 So, if demand for physical gold is so strong, how could there possibly be such a price drop as happened in 2013? The answer is simple really. They have created a paper gold market that is hundreds of times larger than the physical gold market. By larger I mean in terms of the dollar value of trading in these two markets. People trade paper that has more or less of a connection with gold (sometimes none at all), and it is in these large markets that the price of gold is set. Most of the participants in these paper gold markets believe that they could, if they wished, convert these pieces of paper into physical gold, that the pieces of paper are claims on real gold. But in reality, only a tiny fraction of them could succeed in converting their claims into real metal. There just isn’t enough metal to go around. 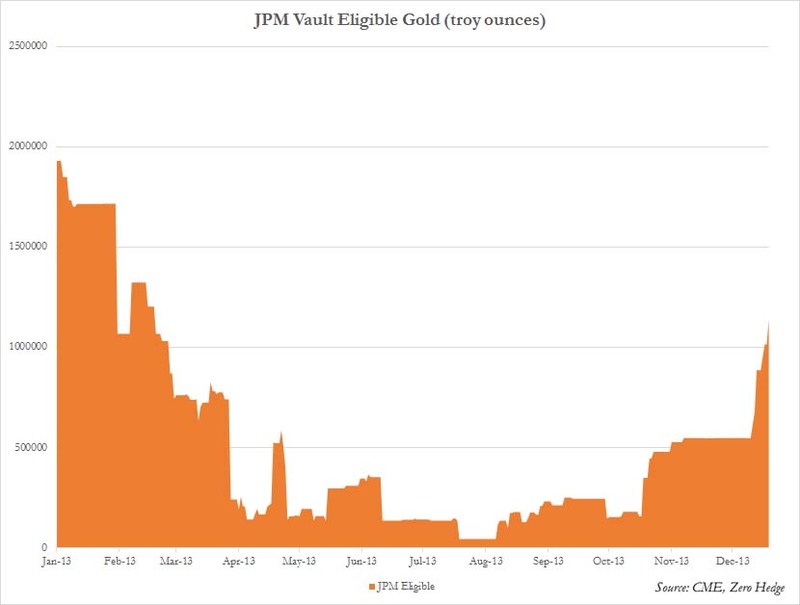 The key phrase on the chart is “Owners Per Ounce,” which for the COMEX is now at 111 owners per ounce of gold in the vault! That is, for each ounce of gold in the COMEX vaults (the blue line in the upper section of the chart), 111 contracts exist that allow the owners of those contracts to demand delivery of that single ounce of gold. We all understand that banks operate with only a little cash on hand for all the deposits they’ve taken, called a fractional reserve system. The COMEX is the same, worse actually: percentagewise, they keep a lot less gold around than the banks keep cash on hand. (Please skip this paragraph if you already understand what 111 owners per ounce means!) Let me explain: The COMEX is a futures trading exchange where people trade gold and other commodities. Futures exchanges were created to be a meeting place between producers of a commodity and its end users. In January of any year, for example, a producer of wheat can agree to sell wheat in the future, in September, at a specified price to a cereal company. Both the wheat farmer and the cereal company know that they can make a reasonable profit on their operations if the farmer supplies, and the cereal maker takes delivery of, wheat at the pre-arranged price when that wheat is ready in September, so they make the deal. That’s called a futures contract. It promises both delivery and payment in the future at set price, and that’s great. But the futures exchanges are now dominated by big money speculators who have no intention of producing or taking delivery of anything. The chart above reflects this reality. The COMEX vault is supposed to have gold to back up the gold trading that takes place on that exchange. 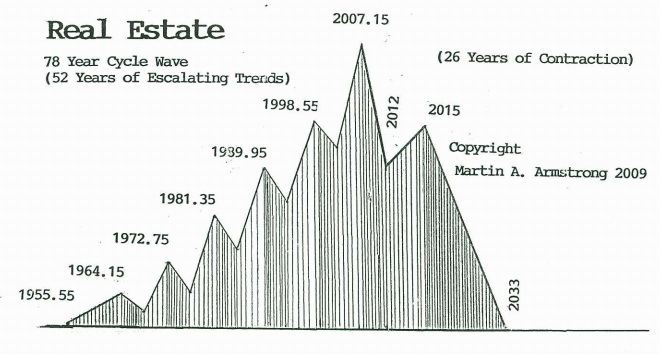 As you can see in the upper panel of the chart, back in 2006 they had over 5 million ounces backing up the contracts. Now that amount has fallen by 93% to only 370,000 ounces as more people realize that they better stop trading paper and get their hands on the real stuff. Currently, for all the futures contracts to buy and sell gold on the exchange, they only have 1 ounce for every 111 contracts in existence. These contracts are paper gold, a huge synthetic supply of fake gold. If everyone decided to make their claim for real gold (similar to a run on bank), only 1 ounce would be available for every 111 claims. Such an attempt would drive the price of physical gold into the stratosphere. On a typical day last week, 55,000 of these paper contracts traded hands. That represents 5,500,000 ounces of paper gold traded each day just at the COMEX. That trading sets the price for gold in the US. But it’s possible that no one demanded delivery of gold from the COMEX on that same day. So the trading that sets the price is really for cash, not for gold. And this paper trading involves a lot of borrowing, that is, leverage. One can easily prove this crazy situation by contacting a futures broker and creating an account with $8,000 in that account. 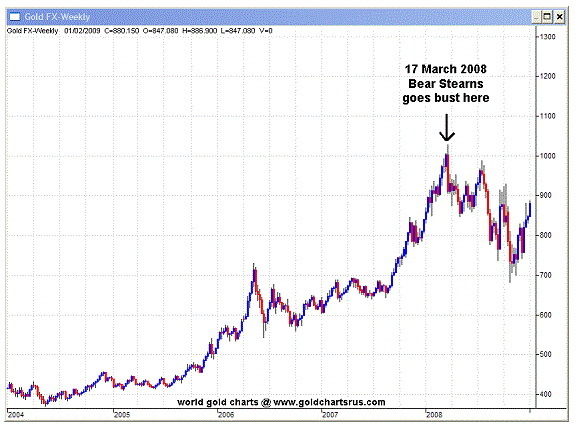 One could then buy or sell (they call it selling short) a futures contract for 100 ounces of gold. At today’s price of $1,338 per ounce, 100 ounces of gold is worth $133,800. So as far as COMEX is concerned, you are using your $8,000 gambling stake to control $133,800 worth of gold. And this “gold” can be sold, driving down the price. Seems crazy, but it’s literally true. So if you or I can control 100 ounces for $8,000, imagine what JP Morgan and Goldman Sachs can control with the many billions of printed money they receive from the Federal Reserve, printed money that has not been lent out to boost the economy but is being used as collateral for trading. They can push markets in whatever direction they want. The same is true for central banks, but on an even greater scale: They have no limit on the amount of cash they can print up, so they can overwhelm any market anytime they wish. The COMEX sets the price in the US. In London, it’s the LBMA (London Bullion Market Association) which is more than 7 times larger than the COMEX in terms of the dollar value of daily paper gold trading. The LBMA admitted a couple of years ago that, like the COMEX today, their leverage ratio was over 100 to 1. 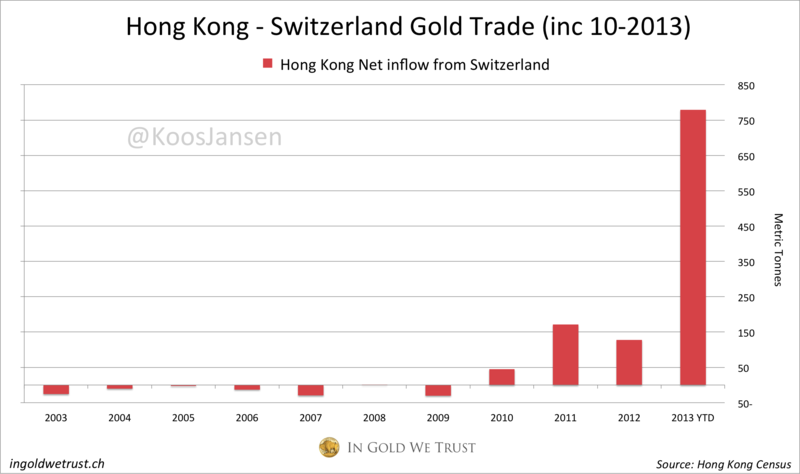 And the gold market in Switzerland is just as large as the LBMA, but it is run privately by the Swiss banks, so they publish no statistics. All told there are 40 futures exchanges in the world for trading paper gold. Another form of paper gold is certificates for gold accounts with banks. Several of these banks have been caught charging people fees for storing gold when they are actually storing nothing at all. The banks figured they could quickly meet any claims for the gold, but when the claims came in, it took them weeks to procure the gold in the open market. We are still active in the gold market for our own account…meaning that we are in the market nearly on a daily basis. In that same paper, the Bank of France said they owned 2,500 tons of physical gold and that they had no plans to sell it. So what are they trading daily? Paper gold, for profit. Sometimes people go way too far with these contracts. People thought that Bear Stearns went bankrupt in 2008 because of the mortgage market. But the astute article What Really Happened to Bear Stearns by Ted Butler explains that it was actually bad trading in gold and silver that took them down: they had massive bets that the prices of gold and silver would go down, but instead the prices shot up by a lot over a few months instead. It sure makes one wonder whether JP Morgan was involved in both moving the price up to bankrupt Bear Stearns, and then smashing it down once they had taken over Bear and inherited all those bets that the prices of gold and silver would drop. What? Isn’t it illegal to corner a market? Don’t the regulators come down hard on anyone trying to corner a market? Yes, but as long as it isn’t gold or silver. JP Morgan is allowed to corner gold and silver because it serves the interests of those who still want the US Dollar to dominate the world so that the US can continue to exercise its “exorbitant privilege” of printing paper to trade for the real goods of other countries. So if someone like Morgan and the central banks weren’t suppressing the prices of gold and silver, it would make the Dollar and the other paper currencies look bad, and those in charge won’t allow that. To show you how off base these government people and economists are, when Nixon took the world off of what remained of the gold standard in 1971, his chief economist was the “great” Milton Friedman. Friedman told Nixon and others that gold was deriving its value from the US Dollar, not the other way around, and that as soon as Nixon severed the link between gold and the Dollar, that the price of gold would actually fall quite a lot. He was entirely wrong, as government economists so often are, as gold never looked back again at its then-current price of $35 per ounce. These government types have always hated gold for one reason: it inhibits their ability to wage war. We’ve covered it before: governments started going off the very-successful gold and silver standards in order to fight World War 1. That war would have been over in a few months, but that wasn’t good enough for the warmongers, they had to kill off millions of people over four years to serve their greed. 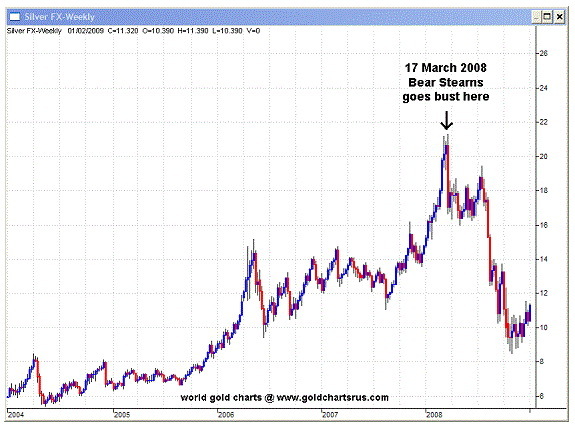 We’ll talk more about governments and gold later, including their failed attempts to suppress gold in the past, in Part 3. But you know that comment above about the gold price going into the stratosphere when people with all these paper contracts rush to convert them to physical gold? That will happen. It’s inevitable, as more and more people lose confidence in governments, banks, and the blizzard of paper claims they have created. That COMEX chart above–where it shows that the physical gold backing up the paper trading is down by 93%–says that the process is already well underway. Best to get your gold and silver before all those folks with the paper contracts try to get some because, at that point, it will be tough to find real gold at any price. Most people have been trained to internalize only those ideas that come from honchos, that is, political and religious big shots, “experts,” very rich people, celebrities, etc. The powermongers capitalize on this when faced with criticism of the system by often resorting to what the logicians call ad hominem attacks, that is, they deflect attention from the criticism by attacking the person delivering it, attempting to undermine that person’s credibility. They characterize the malcontents as crazy, unpatriotic, uninformed, uneducated, or as crackpots, charlatans, imbeciles, demons, and so forth, while never addressing the issue at hand. So for a more general public understanding of the nature of our system, it helps when people considered to be honchos start publicly discussing what is in fact going on. Other honchos are less likely to try to pull the ad hominem attack on one of their own. In other words, truth about the nature of our system needs to emerge from the blogosphere and into the mainstream. This process is accelerating. We have a corrupt politics to the core. Both parties are up to their necks in this. It really doesn’t have anything to do with right wing or left wing. The corruption, as far as I can see, is everywhere. Sachs follows that by saying that he meets with the top Wall St CEOs on a regular basis and the common feature he observes is that these people believe they can do anything they want, legal or not, with impunity. And that given their takeover of the politicians and regulators, they are correct! Now this isn’t coming from MIT’s Prof. Noam Chomsky–who, let’s face it, was decades ahead of all of us in pointing out the criminality of the corporate/political system–it’s coming from a highly respected Columbia professor. For a few years now, the money printing central banks such as the US Federal Reserve (the central banks have directly printed at least $16 trillion and counting) have been told by bloggers that this money is not supporting jobs and the economy, but rather that it is going to the rich who are bidding for financial assets and causing bubbles in multiple asset markets including stocks, bonds, and real estate. People like Ben Bernanke, his henchman, and academic and Wall St economists have denied this. And for years, bloggers have said that the central banks cannot possibly stop printing more and more money or the whole edifice will crumble, another charge that is roundly derided. The Fed has claimed repeatedly that it has the tools to undo all the money printing so that it will never cause a problem. But now their own banker advisory panel says that if the Fed stops printing, it “may be painful for consumers and businesses…” and that “the Fed may now be perceived as integral to the housing finance system.” In other words, if the Fed stops printing, the “housing finance system” will collapse. Which it would. In a heartbeat. People like Matt Taibbi of Rolling Stone have been stalwart in documenting the ongoing manipulations in the interest rate, municipal bond, derivatives, and oil markets. And others have offered very strong evidence of manipulation of the stock market and precious metals markets. Taibbi recently wrote that “everything is rigged.” The US Bond market, the largest in the world, is certainly rigged: the Federal Reserve itself buys 75% of the bonds issued by the US Treasury. And the Fed announces, at the start of each month, which days it will be buying bonds through the Wall St firms in the coming month. The stock market always rises on those days. Always. Why? Because the Wall St firms take that money, leverage it up by further borrowing, and buy stocks. The Fed wants exactly that: they believe that a rising stock market makes people feel a “wealth effect” and therefore they will go out and spend more money in the real economy. We would stress that we fully understand why the authorities wouldn’t want free markets to operate today as the risk of a huge global default and unemployment cycle would still be very high. …over the last several years, [the Fed] has over-promised and under-delivered, and the bank’s most important asset – credibility – is under attack. What’s interesting about gold, when we had that big break two weeks ago we saw all the gold stocks trade down significantly, we saw all the gold products (ed: futures) trade down significantly, but one thing that did not trade down, was gold coins, tangible real gold. That’s going to show you, people don’t want certificates, they don’t want anything else. They want the real product. A senior Chinese auditor has warned that local government debt is “out of control” and could spark a bigger financial crisis than the US housing market crash. This system is coming apart at the seams. Insiders and whistlebowers are finally describing the details. The US Government realizes this and is desperately trying to keep whistleblowers from telling the truth by filing charges against them and trying to ruin their lives. Ultimately, it won’t work. I just hope that everyone reading here takes those actions they need to take. By the time the collapse is on the television Nightly News and Page 1 of the newspapers, with the system honchos all claiming “No one could have seen this coming,” it will be too late.